Sometimes the drain pipe behind your retaining wall must be raised to accommodate outlets through the wall face. A shelf of low permeable granular soils, level with finished grade should then be created to prevent water from ponding below grade. 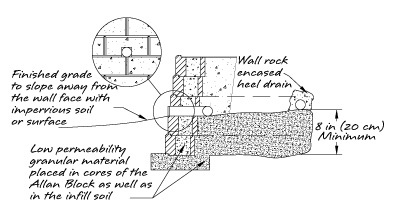 See Allan Block Design Detail #4 – Alternate Drain, in the Allan Block Spec Book.